The Boundary Ranch Registered Angus program began with Darby’s grandparents, Jean (John) and Florence Delorme, of Jay en Dee Angus in 1963. The legacy continued on when Don and Connie Delorme of South Shadow Angus bought Jay En Dee females in 1993. 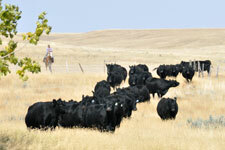 We are the third family generation to raise registered Black Angus cattle. The Delorme family has always had the same goals when it came to producing cattle; they should be able to survive and flourish in the semi arid area of South-West Saskatchewan where the grass is truly “short grass” and animals have to travel long distances to reach water. As you can imagine the cows have to be moderate framed and easy doing, with meticulously sound feet to travel those distances. Udder confirmation is also important to us, as well as a good hair coat, longevity, and docility while still being a protective mother. Our pastures are located half an hour to an hour away from home and we don’t have time to be checking on the cows on a daily basis. There are still a lot of cows from the original group purchased from the Jay en Dee herd in the South Shadow herd and we feel that says a lot for the potential longevity of our own herd. We strive to produce the ultimate cow, but do not overlook the performance of the breed; a good balance is what we try to produce. Along with the Akita cow family that we acquired from Darby’s parents, we also had the opportunity to take some cows on share from Terry Knodel of Big Sky Stock Farm to increase our herd and get some different blood lines. We’ve sold a lot of bulls out of these cows in the past and some of our customers enjoy the performance and size that the Big Sky cows provide. The cows we acquired from Terry are from the Dyna, Diamond Mist, Karama, and Beauty cow families. The cows are no longer on lease, but we have many daughters from these females retained in our herd. Most of our cows are Artificially Inseminated and we try to use as many new and exciting sires as possible. Our clean-up bulls are, and for the most part always have been, from the South Shadow Angus or our own herd. As we raise purebred and commercial cattle, we tend to treat our purebred herd a lot like our commercial, since most of our bulls go to commercial herds or are used in our own herd and will never be pampered. The calves are never creep fed and therefore have to have natural do-ability. We believe the cow should work for you not the other way around. 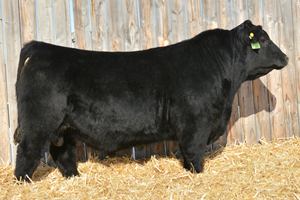 Above: A bull calf out of the Akita cow familyBoundary Chinook 46E, the High Seller at the 2018 Your Choice Bull Sale. 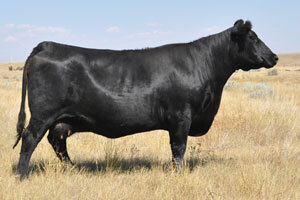 Above: Akita 25P; one of our favorite cows and most consistant producers in herd. Still going strong at 14 years old. 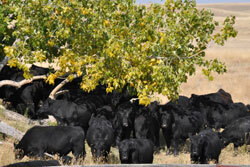 Welcome to the Web Tour for our Registered Black Angus Herd. If you would like to view pictures, progeny, and production records of each individual cow family please follow the links below. "The pairs are moved to summer fields of tame grass (optimally) in early May. Come June they hit the native grasses. Weaning takes place mid-September. The cows go back with the commercial pairs on native fields until the commercial calves are weaned. October through December they graze stubble and marginal lands with winter conditions dictating when bales are provided. The purebred breeding herd share a winter feed ration with the commercial herd. Early winter feeding is rolled out dryland grass/hay and greenfeed bales. As calving time draws near, they are sorted from the commercial herd, bunks are moved to their lot and a similar ration is tub-ground for higher energy and nutrient value. The weaned heifer and bull calves are bunk broke on a straight roughage ration of dryland grass/hay bales. About 3 weeks after weaning we do try to pail feed home grown rolled barley twice a day for a few weeks, to quieten down the bull group. The most grain the bulls will receive is 8 lbs /head/day ~ a gradual increase reached at 12 mths of age. The heifers receive no grain supplement. Roughage ration varies depending on the severity of our winter; it is a weighed measure of dryland hay & greenfeed bales. " our families “Your Choice” Bull Sale in Maple Creek SK., April 2nd, 2018. Please come join us at the Sale and feel free to stop by for a visit anytime. 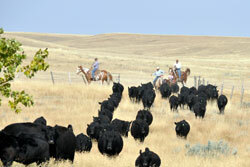 None of our angus cattle are creep fed and our sales are later in the spring so our bulls don't have to be pushed. Taking our time to get our bulls into proper sale shape ensures that there will be no feed related problems with feet and overall soundness. Haven’t we all watched an expensive, over fat bull waste down to nothing at some time or another? Natural thickness and muscling is our goal. Please feel free to take a gander at our 2018 Bull Sale Offering. Above: Our Angus Bull Calves at Weaning.